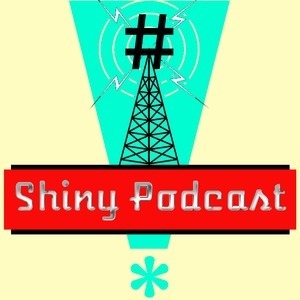 43 episodes of Shiny Podcast since the first episode, which aired on September 9th, 2017. This week: the guys cover the degrading state of MacOS security, India sets the bar on open internet regulation, Tesla's Tractor Trailer, How Bitcoin and Ethereum differ and why blockchain technology is taking over everything. PLUS, we discuss why DRM has nothing to with copyright and how we just lost control of the web. This is kind of a miserable week and please don't ask about episode 5. It doesn't exist and you can't convince us otherwise. Anyways we tackle such subjects as loot boxes, just how much the FCC doesn't care about being as evil as possible, Equifax continued incompetence, the demise of the Windows phone, and more! If you've been looking for the perfect excuse to get back into buying action figures, we have Jared Beerman of Beerman Photography to tell us how he got into taking pictures of toys and what inspires him. Before that we compete to see how many pages of information Tinder has on you, how toxic the gaming industry fan base can be, Linux explodes (relatively speaking) in market share, and more! This week we get our hands real dirty handling the muck Equifax has bestowed upon 140 million Americans, the good, the bad, the ugly of the new iPhone X, announcement of our new tangential gaming project, and more! The end of the summer... how evil is Google? Massive solar power arrays! New blockchain currencies, no more Solaris and much much more! Android Oreo Released and a new iPhone on the horizon! Zero Day market is soaring! New space gear, ChromeOS for Enterprise, Killer robots and much, much more! August 24 2017. A date that will forever be remember as the genesis of the Shiny Podcast. A new show hell bent on casting light and throwing shade on the latest in gaming and technology. We kick things off by speculating on upcoming Android O, chatting about AMD's new hardware, discussing WannaCry, and pontificating on Chrome's market dominance.